No matter how much time and effort you put into making a global training program instructionally sound, its effectiveness can all be undone by inadvertantly offending the audience. 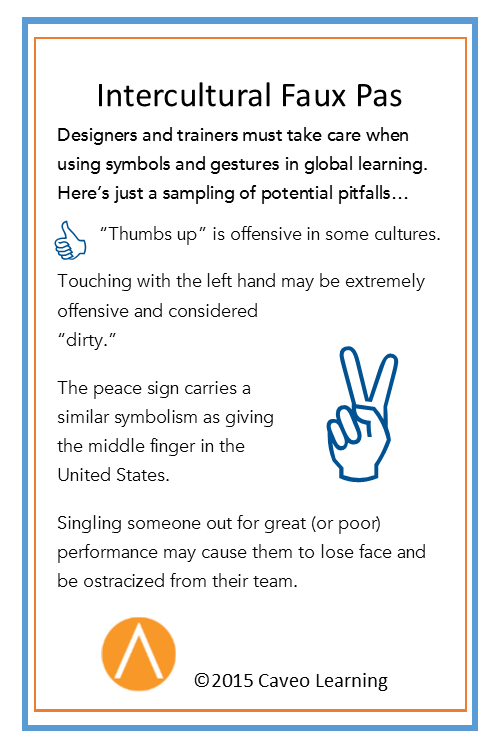 When designing training beyond borders, it is absolutely critical to understand cultural differences and sensitivities, lest you communicate a message that you most definitely didn't intend. For example, consider an everyday, seemingly positive gesture like giving the "thumbs up" sign. This would be extremely offensive in certain parts of the world. It can be just that easy to lose your audience of learners, simply by selecting a graphic or photo that is inappropriate in other cultures, or by using language that loses its intended meaning in translation. As instructional designers and training facilitators, we can sometimes forget about or overlook the unique and diverse pieces that make up the mosaic of our workforce. The training materials we create may end up being used in a far-off region, being read through a completely different cultural lens and potentially being misunderstood. We all know how important our employees are, and we want all of them to feel welcome and valued. The challenge with global workforces, whether dealing with international offices or with diverse employees, is to ensure that everyone feels like a valued team member. It is hard to rebuild that trust once the damage has been done, so it's necessary to be proactive and considerate in your messaging. International etiquette isn't just for world leaders, it's for everyone. In fact, companies that can master this are more respected and favorable to do business with. It's no small task for organizations to relate and stay connected to their global workforce, and it is wise to team with translation and localization services experts—or at least peruse some business travel websites—to master the dos and don’ts specific to given regions and cultures your organization will be interacting with. How can we avoid culture conflicts? Unfortunately, there isn't a silver bullet or single solution that meets the needs of all cross-cultural learning challenges. However, if you are developing a company-wide training or communication piece for a global audience, make sure to learn about the audience and tailor your messaging accordingly. Avoid common cultural pitfalls by following these four steps. Familiarize yourself with the people and cultures throughout your organization, capped off with a thorough global audience analysis. Likewise, unerstand the varying ways business is handled or discussed in different regions your organization does business, particularly obstacles that may cause delays and or people from working with you. Obviously, before creating any training deliverables, you need to know where the materials are likely to be deployed—as well as any regions the deliverables may be used further down the road. This is relevant even for training programs that will be largely for onshore workers. Consult with human resources to gain a better view of the cultural backgrounds and national makeup of your domestic workforce. Scour the Internet for information about a given region, its culture, and the relevant dos and don’ts, including sensitive topics to steer clear from. One easy-to-navigate website is ExecutivePlanet.com, which provides culture-specific information on topics like making appointments, dress codes, conversation, addressing others, gift giving, negotiating, entertaining, and public behavior. You may also want to pick up a couple of books: Terri Morrison’s "Kiss, Bow or Shake Hands," and "The Essential Guide to Training Global Audiences," co-authored by Caveo Learning's own Renie McClay. A picture can say a thousand words. What does your organization want to say to its employees? Use images that are representative of your organization. For fun, you can have locations submit photos of their work teams. These images can be used in training presentations, internal communications, and even external communication pieces (with the proper permission and signoff, of course). Whatever your vehicle of expression—training presentations, videos, memos, etc.—be sure to write clearly and avoid unclear messaging. You may want to maintain a more formal voice by avoiding idiomatic expressions, as well as local or national landmarks or reference points, and other American-specific cultural items like sports. For example, “We really hit that out of the park,” is an expression that would only make sense to someone from a culture where baseball is played, which is a relatively small segment of the world. You want to always be clear and inclusive in the language you use. Communicating to a global audience is an art form. Much like being politically correct, being culturally correct is an important part of being an organization that is respected and desirable to work for. To identify which of your employees are ideal candidates for cultural awareness training, consider the following. 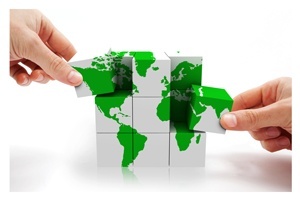 Do you have employees who are in international roles? Perhaps you have a project manager or business development group that works with other countries internally and/or externally. Do you have departments in your headquarters that manage business processes for the entire company? Or perhaps, managers have direct reports from other cultural backgrounds? Consider your company’s business goals. If you have plans to expand into other markets, it is the perfect time to get familiar with the business practices in that country and identifying ideal candidates to participate in that training. Diversity and inclusion training will help to make bridge cultural gaps and make employees more culturally sensitive and aware.